DERIVE Soundscapes Radio is a brand new soundscape/jam/performance session broadcast live on YouTube from Deakin St coffee stand in Tokyo featuring music from sound artist SJF over the last year •• to be expected: field recordings from inside monolithic public housing buildings in Japan, dark drones & lush clouds of sound. It will be broadcast on the 1st Friday of every month in 2019 and episode one begins at 7pm (JST) this Friday. The full video will be subsequently uploaded to YouTube for those in a differing time zone. 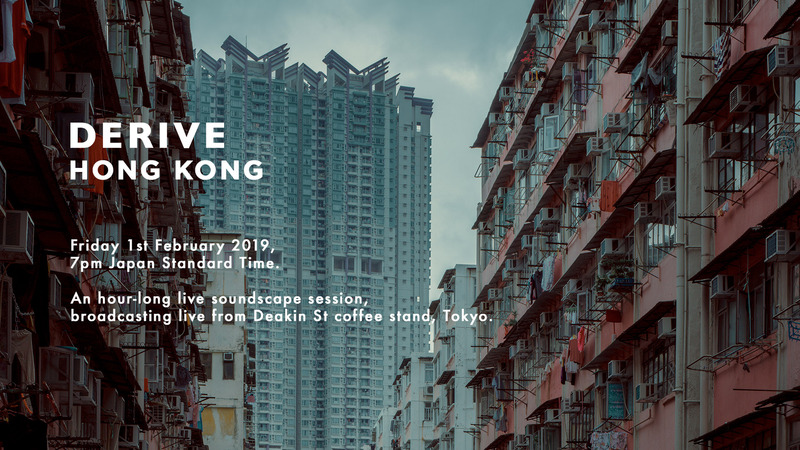 A little bit more about the DERIVE Soundscapes series can also be found here. Tuning in now as I take my night walk around Kawasaki and Tokyo!! Can you tell us more about the cover image? Wow thank you for the fascinating book recommendation. I’m really interested in this topic; I’ll definitely pick up a copy and let you know how I get on. All of the images I use for the DERIVE Soundscapes series come from photographer Cody Ellingham who I’ve collaborated quite a fair bit with over the past year. He travels around countries in Asia taking stunning photos as he goes. He’s released a few zines of his images and travel stories which can be found on his website here. There’s a huge boom recently in cyberpunk-inspired neon-filled photos of Tokyo, Seoul et al. and whilst I feel that it’s becoming a bit of a quick-buck fad I honestly admire Cody’s work because he’s doing so much more than just applying a pink/blue filter to a few photos. He tries to tell the stories of the city in the process; past, present & future.